Prapoutel is your ski resort of choice if you are looking forward to well-equipped resort to spend your ski holidays - there is plenty of options for skiers and snowboarders to chose from. Also, there are many off-ski activities and the city of Grenoble is 1 hour drive from there. We at Alps2Alps will be more than happy to be you transfer partner from your chosen airport to Prapoutel. This ski resort is a part of three winter sports resorts group - Les Sept Laux. It is located 35km from Grenoble and 50km from Chambery, therefore it is easily accessible from several airports. The wonderful mountain scenery guarantees breathtaking scenery while skiing in one of the pearls of Western Alps. There are no direct trains to Prapoutel. The closest train station is Grenoble - daily bus connections from the train station to Prapoutel are provided. You can be sure that Alps2Alps will offer the best price possible when choosing transfer service to Prapoutel - our main goal is to provide the lowest price with best service. If you are traveling to Prapoutel in the off-season and off-peak time, you can count on great discounts and remember that if you choose your transfer in midweek (Monday-Friday), the prices will be up to 60% lower than weekend prices. Apart from factors mentioned above, your final transfer price will be influenced by vehicle availability, transfer schedule, vehicle utilization and other costs like airport parking charges and road tolls. To discuss any specific needs or your plans to travel as a larger group, please get in touch directly so we can discuss this. Prapoutel is a well hidden and unknown little gem that offers a variety of large ski pistes and great panoramic views. 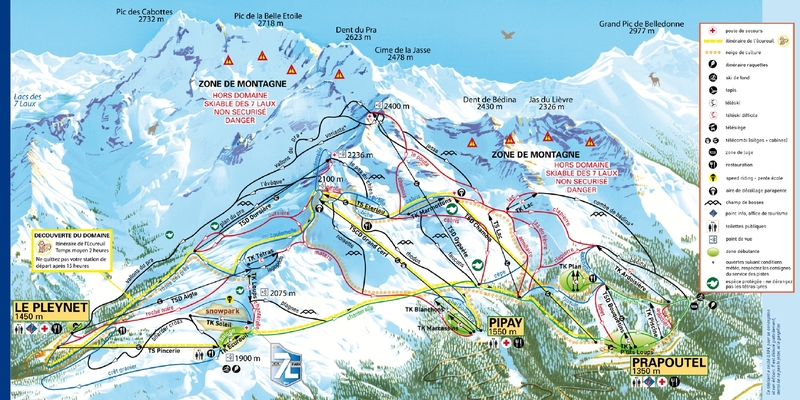 Snowpark and off-pistes are also available. Local ski schools at Prapoutel will be glad to help to improve skiing skills for all ages and skill levels. There are discounts for families with kids. This ski resort is a friendly destination for those who would enjoy a day out with family and friends - snowshoeing or dog sledding, paragliding, microlight flights, ice skating, tobogganing, walks in the forest using snow rackets and wellness center are just some of the activites that you can enjoy in your free time. If you are in search of best possible transfer deal to Prapoutel, then Alps2Alps will be the right choice. During peak season, transfers tend to fill up very fast - therefore book your transfer early to have a great start of ski holidays. Whatever it takes to get you to Prapoutel in comfort and on time, you can count on Alps2Alps.